SeedCode Documentation: GoZync4/How does GoZync manage conflicts? How does GoZync manage conflicts? In general, the last Zync wins if more than one user is editing the same record. But with Field Level Merge, you can elect to only sync the fields that have changed, so a user editing one part of a record won't conflict with another user editing another part. Syncing just the data a user "owns" ie a found set. More here. "Checking out records" so that records pulled down to mobile are locked on the server (below). 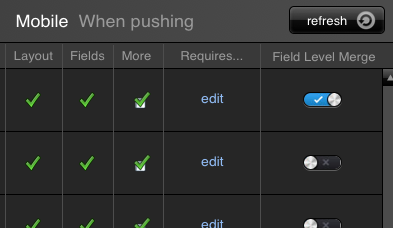 Using field level merge to only sync changed fields instead of changed records (below). Conflicts are not an issue if you're syncing data specific to the mobile user and/or you architect your database correctly (have a table of notes records instead of a notes field, for example). Out of the box, we take the primary key of a record you sent up to the server and see if there is a match in the hosted table in your file: if there is, we're editing that record. If there is not, we're making a new record. So if you send a lot of edits to the same record – or separate users send separate edits – we'll process those in the order received and last edit wins. And of course the same thing applies in Mobile: if a record with that primary key already exists on Mobile, GoZync will edit it when bringing down records from the host. Note that you can modify this behavior with Custom Field Mapping so you can intervene, change the order in which we process edits, or branch the scripts to protect certain fields or records.